Rebel's Haven bred its first litter on June 3rd! 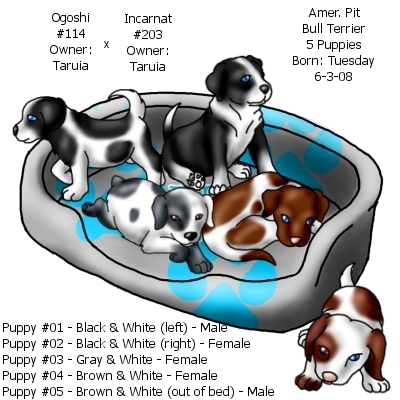 This litter was from Ogoshi out of Incarnat. Incarnat did very well for such a large litter, and all five puppies were born helathy and happy. All of the puppies except one found new homes. This is because Rebel's Haven believes in bettering the Pit Bull breed, and to do so must share well bred puppies with other Pit Bull breeders and enthusiasts. RH Sticky Goodness (Puppy #4) stayed here!